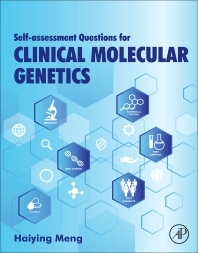 Review Questions of Clinical Molecular Genetics presents a comprehensive study guide for the board and certificate exams presented by the American College of Medical Genetics and Genomics (ACMG) and the American Board of Medical Genetics and Genomics (ABMGG). It provides residents and fellows in genetics and genomics with over 1,000 concise questions, ranging from topics in cystic fibrosis, to genetic counseling, to trinucleotide repeat expansion disorders. It puts key points in the form of questions, thus challenging the reader to retain knowledge. As board and certificate exams require knowledge of new technologies and applications, this book helps users meet that challenge. Dr. Haiying Meng earned her MD from West China University of Medical Sciences, specializing in Forensic Medicine, and her PhD in Forensic Genetics from Sichaun University, China. She completed a postdoctoral fellowship at Yale Child Health Research Center and has held several positions at Cincinnati Children’s Hospital Medical Center and Wright State University in Ohio. Dr. Meng is currently Medical Director of Cytogenetics and Molecular Biology at Baystate Health Center. Dr. Meng has published over 50 abstracts and peer-reviewed journal articles and currently serves on the editorial boards of both Journal of Biochemistry and Molecular Biology in the Post Genomic Era and ISRN (International Scholarly Research Network) Genetics. In addition to delivering numerous lectures and national presentations, Dr. Meng has written over 1,000 review questions to help genetic counselors, medical genetic residents/fellows, molecular pathologists, and medical students study for the board exam, which is the basis of this project.